Apple is in the process of cutting software titles and some hardware peripherals from its retails stores to make room for other services. [ad#Google Adsense 300×250 in story]Sources that I’ve spoken with said Apple is going to expand its personalized in-store setup service for customers that purchase a Mac. With that service, launched in January, an Apple store employee will sit down with the customer and setup email accounts, an iTunes account and walk the customer through the Mac experience. Due to the popularity of the personalized service, Apple is expanding it and will need to make more room for employees to work with customers. In some stores new employees are being hired to handle the setup, while in other stores the employee that made the sale will be the one to do the setup. Whether new people are hired or not depends on the individual store. Clearly, taking product away from the iPhone, iPod and iPad sections is not an option. Those products are some of the company’s top selling units. 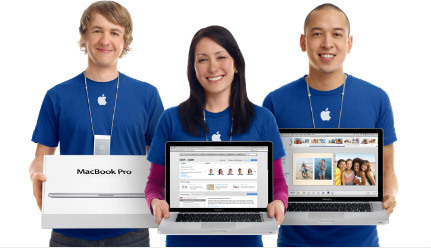 Apple certainly wouldn’t remove any Macs from their retail space, so that leaves third-party Mac products. Among the products that will no longer be displayed in the retail stores are printers, scanners and possibly some hard drives. These peripherals will still be stocked in the store and available if a customer requests them. At the point of sale, the Apple salesperson will still recommend the customer purchase one of those peripherals if they feel it fits in with the customer’s purchase. Games are not the best selling software titles, so they were the first to get cut when the company was looking for additional retail space. The game titles being removed will not be stocked in the stores and retail employees will tell customers to visit the Mac App Store if they wish to purchase a title that is no longer being carried. This could be the first move where Apple would recommend that customers from its retail locations take advantage of its online App Store. There have been success stories already for the Mac App Store, like Pixelmator grossing $1 million in the first 20 days it was open, but it’s unclear if software makers will do as well online as they have in retail stores. The personalized setup service is yet another way that Apple is setting itself apart from its competition. While we don’t know the extent that things like Microsoft retail may affect Apple stores, it is important that Apple stay ahead. It’s thought that about 80 percent of Apple’s retail locations will offer the personalized service and go through the hardware and software product changes in the next few months, if it hasn’t started already.